Next spring the Campus Buzzway at UC Davis will burst with buds, blooms and bees. 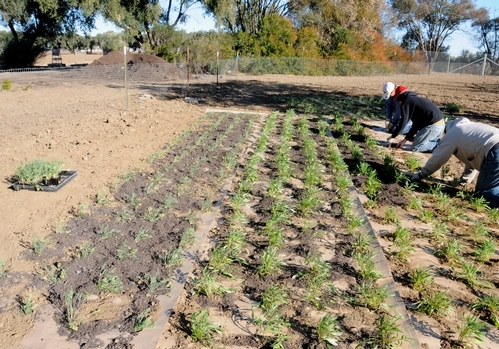 The Campus Buzzway, a quarter-acre field of wildflowers, took root the third week of November when a crew planted golden poppies, lupine and coreopsis (tickseed). Or more precisely, Eschscholzia californica, Lupinus perennis and Coreopsis granidflora. The garden is a gift from Häagen-Dazs, which also funded the design competition for the half-acre Häagen-Dazs Honey Bee Haven. 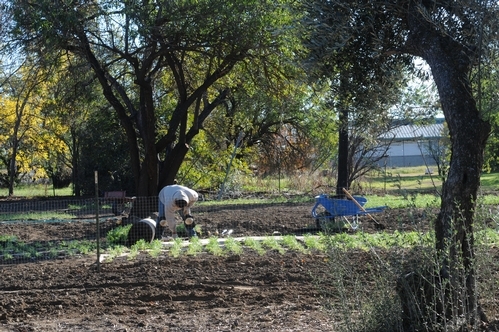 Both bee friendly gardens are located on Bee Biology Road, next to the Harry H. Laidlaw Jr. Honey Bee Research Facility. Many other donors have stepped forward to make the gardens possible. Think year-around food source for bees. Think public awareness about the the plight of bees. Think educational opportunities for visitors. This is no ordinary garden. The Campus Buzzway is unique in that it not only will sport the UC Davis official colors of blue and gold, but it will include three areas of concentrated plantings surrounded by random plantings of the poppies, lupine and coreopsis. Lynn Kimsey, professor and vice chair of the Department of Entomology and director of the Bohart Museum of Entomology, suggested the design, which also includes narrow walkways. Expect to see scores of local pollinator populations there, too, and folks gleaning ideas for their own bee friendly gardens. Yes! This is the second year that Häagen-Dazs, known for its premier ice cream (about half of its flavors are pollinated by honey bees), has raised funds for honey bee research at UC Davis and Penn State University. At UC Davis, Häagen-Dazs is funding postdoctoral fellow Michelle Flenniken, an insect virus researcher seeking to unlock the mysteries of the viruses that plague bees. Meanwhile, mark your calendars. 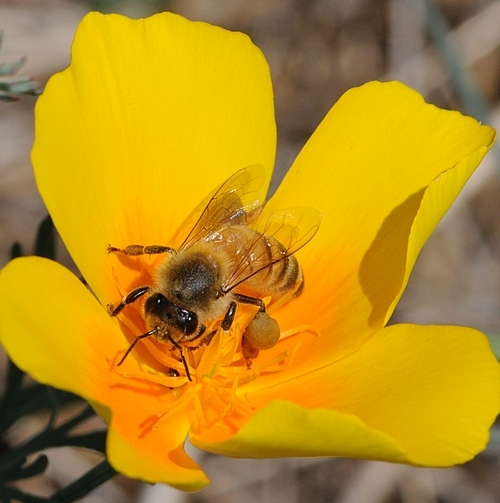 A public celebration of the two bee friendly gardens is set June 19.